Green Man sold out this year. I learnt more about that on my way home, as I ordered Mars bars and chocolate chip muffins from the bloke at Abagervenny train station. “Twenty thousand. That’s it. They don’t want it any bigger. Fiona doesn’t want it any bigger”, he said as I tucked into my refrigerated Mars bar. Why is it only in the countryside that Mars bars are refrigerated? 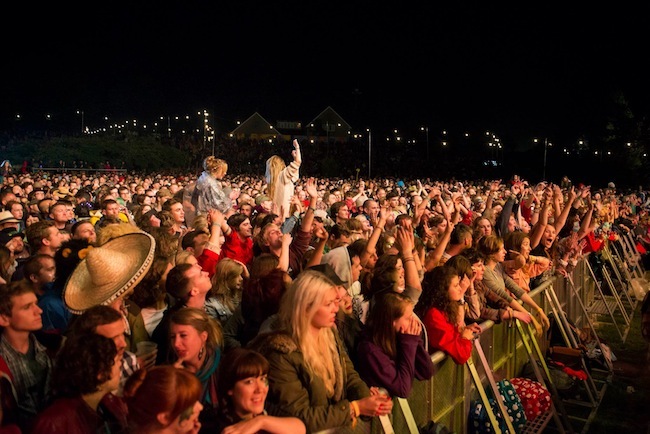 Turns out no one misses that place, otherwise known as London, when they’re at Green Man. It’s a kind of perfected vision of escapism, if there ever was one: amongst rolling hills sits the main stage, which punters can collapse in front of with a beer and watch amphitheater-style on a hill – the rest of the site is equally sculpted and surprising at every turn. Lakes that look like they should probably be caged away coz drunk people are left alone to look pretty, and a bloke who lives on site year-round makes mushrooms out of bits of wood to the delight of loads of kids. You get it: it’s local, but in a big way: it’s all of our locals, even though it isn’t, because we’re from Laaandan. Shudder at the thought. 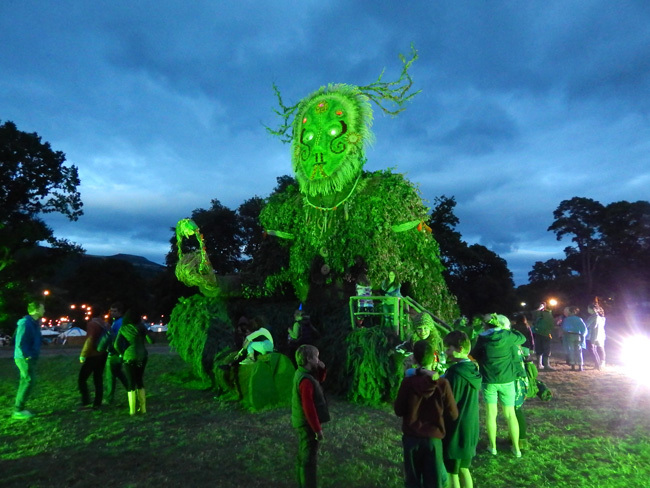 But for a wistful weekend, Green Man is as easy to sink into as a steamy bath at nighttime. There’s too much to do: Welsh dances on slopes so scenic they’re almost parodical, accessible science talks without Latitude-like queues, avant-garde comedians until as late as the music and retro fair ground rides that ramp you up for moreish food (take note, dear reader, that Shepherd’s sheep’s milk ice cream may be better than anything we’ve had in London). And a lack of hot-on-the-heel frantic behaviour between punters makes most things easy to get into/partake in. Talking of easy to get into, the music wouldn’t offend even the most heinous stay-at-homer. 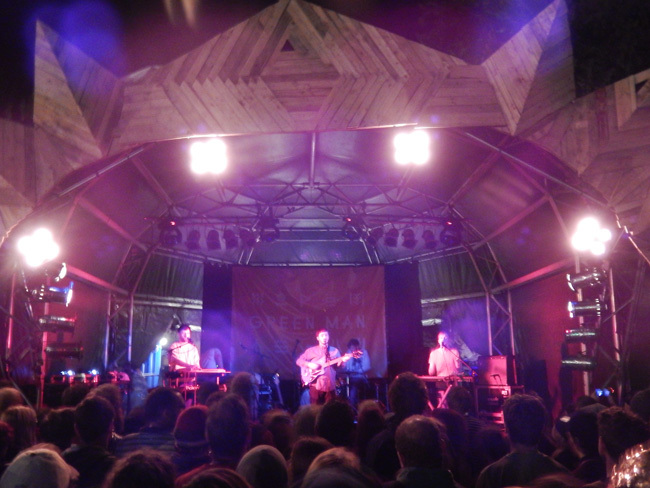 Gently flowing folk from gentle folk staples like Nick Mulvey ebbed from the Mountain Stage all weekend – although perhaps headliners Neutral Milk Hotel shook things up somewhat with an oddly racketty and unclean set on Sunday. The big screens were off, too – a nuisance to those sat on the hills – but this was apparently the band’s decision. Otherwise, no complaints and Beirut, First Aid Kit and The War On Drugs particularly left us glowing. More high-end stuff from Simian Mobile Disco’s live set put new LP Whorl on the map as an extensively mathy and garishly techno hard-hit, and similarly, Caribou and his live band hit the late night spot with a fuller, less immediately dance-ready force – but Sun still rang in the ears of the darkened masses. A triumphant set from the bashful Canadian, dressed all in white. It gave way to perhaps the most surreal and high-octane set of the weekend from house duo The 2 Bears, who, in collaboration with London party queens Sink the Pink created myriad whimsical on stage images. What’s better, two large guys calling themselves bears, a camp London dance set dancing to songs about bears or both at the same time? A surreal piece of late-night theatre. I Break Horses successfully crossed M83-like synth electro with delectable honeyed vocals borrowed from Sigur Ros’ school, and Kurt Vile and The Violators calmly laid down their rhythmic, blues-laced rock without mutter or utterance between tracks. It’s all in the lyrics, see. A solid effort on Sunday night. 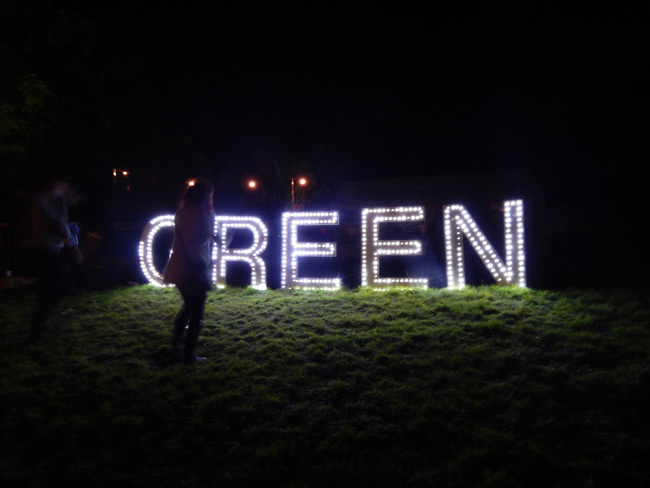 None of it was as solid as what goes on behind those huge walls of the Walled Garden, though, which has been a Culture or Trash stomping ground at Green Man since, like, 2013, man. There’s something about queuing to get in and out, and the fort-like presence of this stage-in-walls that commands an intimacy of its viewers that is priceless and seriously one-off. East India Youth by the dead of night, Ry X by the vitality of sun-struck day. Two memories for the keeps, or something more poetic. Seriously, I shed a tear to Ry, as some few hundred sat cross-legged as the Aussie calmly preached his verse on Sunday’s pm. Final special shouts to Adult Jazz, and French club-ready indie beatsmiths François and the Atlas Mountains, who couldn’t have been any more fun, even if they’d dressed up in stripy shirts and ripped off each others’ French accents for an hour. 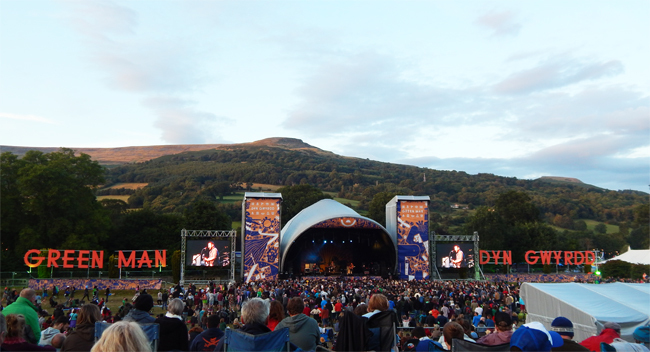 Oh Green Man, you painted the Brecon Beacons red, and then back in London, we turned very blue. May as well end on a folky note, right?